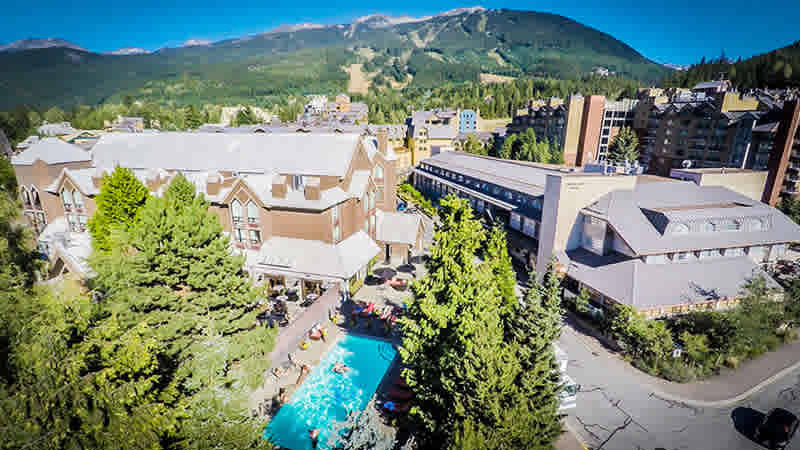 The Adara Whistler Hotel is located in the heart of Whistler Village, just steps away from the lifts, restaurants, bars and shops. This small, friendly boutique hotel offers just 41 guestrooms and suites and has a unique and funky décor. Amenities at the hotel include complimentary high-speed wireless internet access, 24 hour guest services, complimentary valet ski, golf and bike storage and an outdoor hot tub. Room amenities include luxury mattresses and linens, floating electric fireplaces, convenience centre with fridge and microwave, iPod docking stations, flat screen TVs and beautiful views towards Whistler, Blackcomb, Rainbow & Sproatt mountains, or towards the Village. There is an outdoor pool that is only open during the summer months. Choose from deluxe rooms complete with two queen beds or one king bed with custom log headboards. There are also larger one bedroom and two bedroom suites available. The Adara Whistler Hotel is perfect for those looking to stay in the buzz and energy of the Village. Deluxe Queen Suites: Approximately 370 sq ft. featuring two queen beds, convenience centre with fridge, microwave, bodum coffee/tea press with complimentary coffee/tea, kettle, martini shaker, iron & ironing board, in-room safe, IPod dock/clock radio, plush bath robes, hair dryer, stereo/CD player. Suite features a 32" Flat Screen TV, Sony Play Station with floating electric fireplace, work space and chair. All bathrooms have large walk-in showers. Deluxe King Suite: Approximately 370 sq ft. featuring one king bed, convenience centre with fridge, microwave, bodum coffee/tea press with complimentary coffee/tea, kettle, martini shaker, iron & ironing board, in-room safe, IPod dock/clock radio, plush bath robes, hair dryer, stereo/CD player. Suite features a 32" Flat Screen TV, Sony Play Station with floating electric fireplace, work space and chair. All bathrooms have large walk-in showers. One Bedroom Suite: Approximately 500 sq feet with one queen bed in the bedroom and a queen sofa bed in the living room. Convenience centre with fridge, microwave, bodum coffee/tea press with complimentary coffee/tea, kettle, martini shaker, iron & ironing board, in-room safe, IPod dock/clock radio, plush bath robes, hair dryer, stereo/CD player. Suite features a 32" Flat Screen TV, Sony Play Station with floating electric fireplace, work space and chair. All bathrooms have large walk-in showers. One Bedroom Premium Suite: Approximately 500 sq ft. with one queen or king bed in the bedroom and queen size sofa bed in the living room. Efficiency kitchen with sink, fridge, microwave, bodum coffee/tea press with complimentary coffee/tea, 2 element cook top, dishwasher, dining table, kettle, martini shaker, iron & ironing board, in-room safe, IPod dock/clock radio, plush bath robes, hair dryer, stereo/CD player. Suite features a 32" Flat Screen TV, Sony Play Station with floating electric fireplace, work space and chair. All bathrooms have large walk-in showers. One Bedroom Loft Suite: Approximately 500 sq ft. with one queen bed in the upstairs bedroom and queen size sofa bed in the living room. Convenience centre with mini bar fridge, microwave, bodum coffee/tea press with complimentary coffee/tea, kettle, martini shaker, iron & ironing board, in-room safe, IPod dock/clock radio, plush bath robes, hair dryer, stereo/CD player. Suite features a 32" Flat Screen TV, Sony Play Station with floating electric fireplace, work space and chair. All bathrooms have large walk-in showers.